Prototype: German Federal Railroad (DB) class 335 (Köf III) diesel switch engine in Era IV. “Ocean Blue” / ivory paint scheme. Version with radio antenna. Road number 333 009-9. The locomotive looks as it did around 1980. Model: The locomotive has an mfx+ digital decoder and extensive sound functions. It also has controlled high-efficiency propulsion. Both axles powered. The triple headlights and dual red marker lights change over with the direction of travel, will work in conventional operation, and can be controlled digitally. Maintenance-free warm white LEDs are used for the lighting. The headlights can be turned off at both ends. The locomotive has a new Telex coupler front and rear that can be controlled sepa - rately. The grab irons are separately applied. Brake lines are included. Length over the buffers approximately 9.3 cm / 3-5/8“. 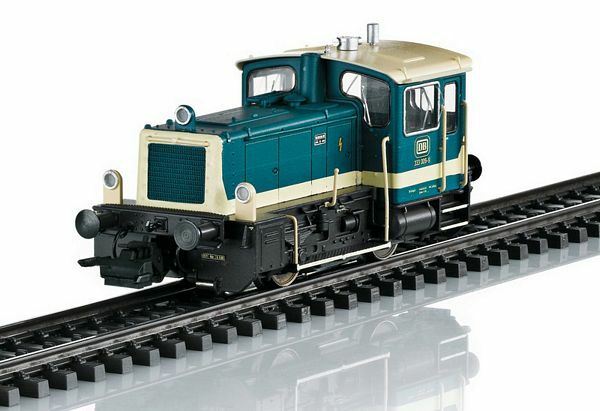 Marklin exclusive special model – produced in a one-time series.